Gumbo was a son of AFC Twist and Shout and could easily have run field trials as his father did. Gumbo finished his APLA and AKC titles by the age of 2 and went on to win many dozens of upland hunting competitions. 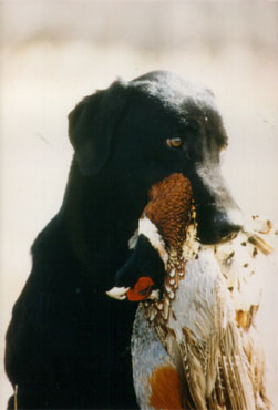 Gumbo was one of the first APLA titled dogs to produce dogs that could not only point well but compete at the highest levels in all the conventional retriever games, including field trials. He has produced well over 15 GMPR’s, MH’s and multiple qualified all-age field trial dogs. Gumbo has arguably raised the standard another notch in terms of what pointing Labs could be expected to do and to produce. Few dogs, if any have so single handedly changed the face of pointing Lab expectations.